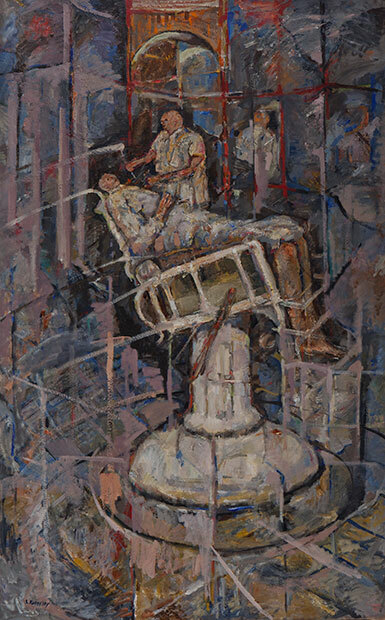 Above: Seymour Rosofsky, Patient in Dentist's Chair, 1961, Oil on canvas. 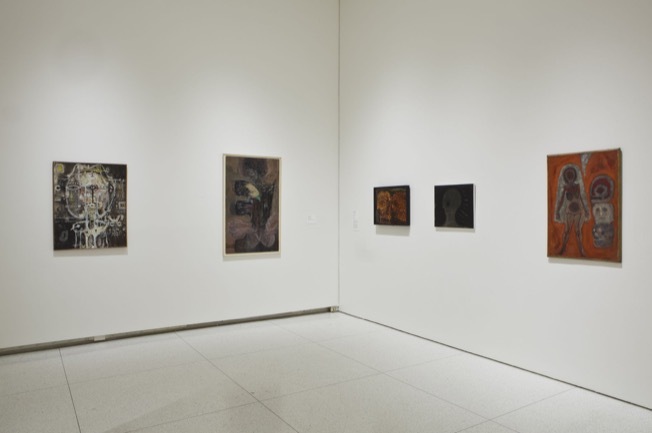 Smart Museum of Art, The University of Chicago, Gift of the Rosofsky Estate, 2014.16. 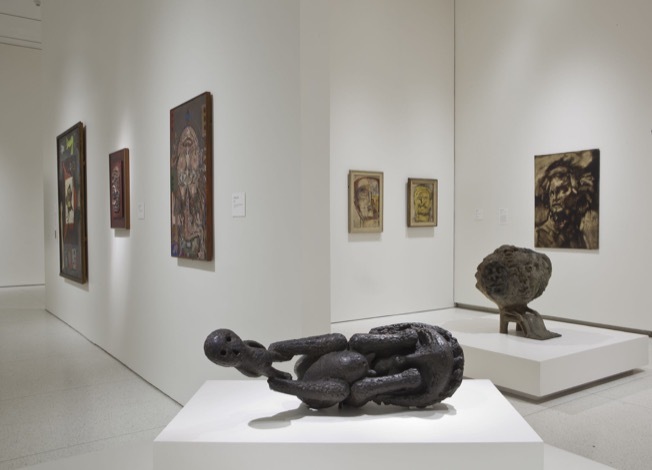 Top: Cosmo Campoli, Birth of Death, 1950–1951, Cast bronze. Smart Museum of Art, The University of Chicago, Gift of Joyce Turner Hilkevitch in memoriam of Jonathan B. Turner, 1991.357. The group of postwar artists nicknamed the Monster Roster established the first unique Chicago style. 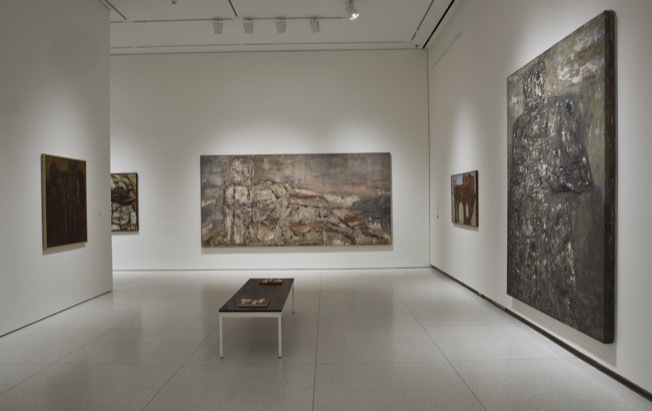 Spearheaded by Leon Golub and united by a shared interest in the figure during a period that is often seen as dominated by abstraction, the group created deeply psychological works that drew on classical mythology and ancient art. 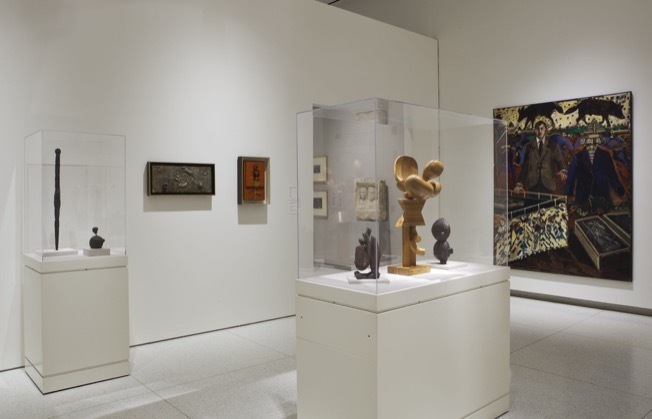 This is the first major exhibition to examine the history and impact of the Monster Roster, which has been overlooked despite being one of the most important Midwestern contributions to the development of American art. 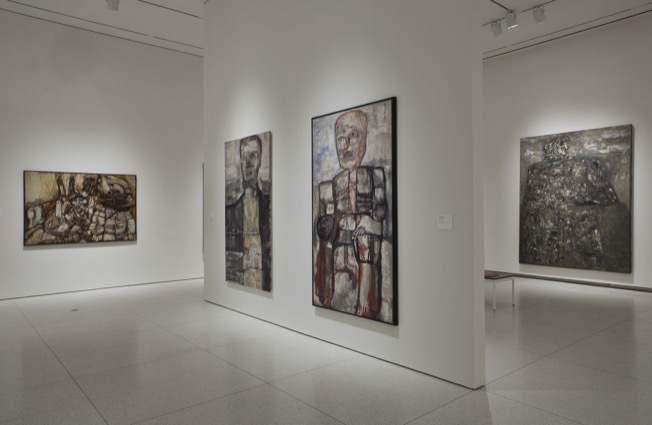 It examines not only the complex aesthetics and personal styles of Golub and his compatriots—including Cosmo Campoli, June Leaf, Dominick Di Meo, Seymour Rosofsky, and Nancy Spero, among others—but also uncovers the Monster Roster’s relationships with preceding generations of Chicago artists and differences from the well-known Chicago Imagists who followed. 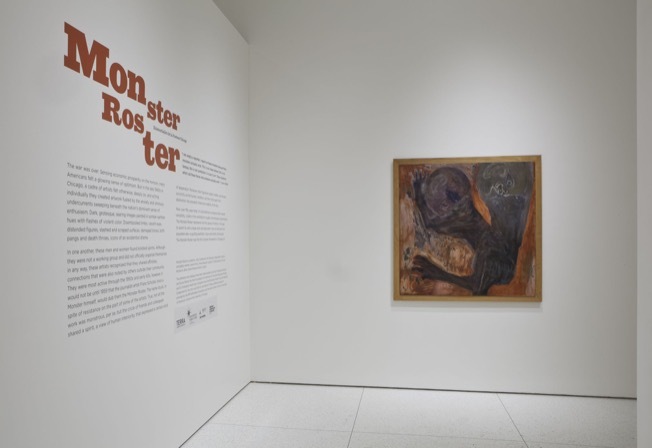 Monster Roster brings together approximately 60 major paintings, sculptures, and works on paper from the Smart Museum and other collections in order to provide the definitive account of the movement, from the formation of Exhibition Momentum in 1948 to the group’s dispersal in the mid 1960s. On view in galleries adjacent to Monster Roster, three related exhibitions and installations explore Monster Roster printmaking, the group’s antecedents and influences, and the next generation of Chicago Imagists. 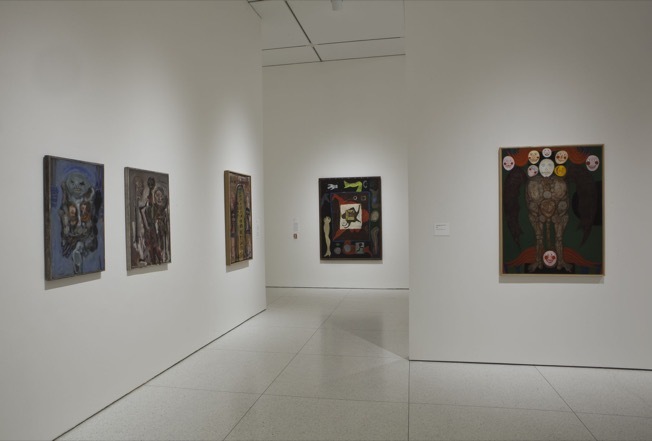 An introduction to the artists and history of the Monster Roster, featuring Jessica Moss, John Corbett, Leon Golub, Irving Petlin, Franz Schulze, and Ellen Lanyon. Monster Roster catalogue receives Association of Art Museum Curators 2017 Award for Excellence. An original poem by University of Chicago student Rachel Harrington, inspired by Leon Golub’s 1956 painting The Ischian Sphinx. An original poem by University of Chicago student Chi Le, inspired by Leon Golub’s 1956 painting Prodigal Son. An original spoken-word performance by University of Chicago student May Huang. 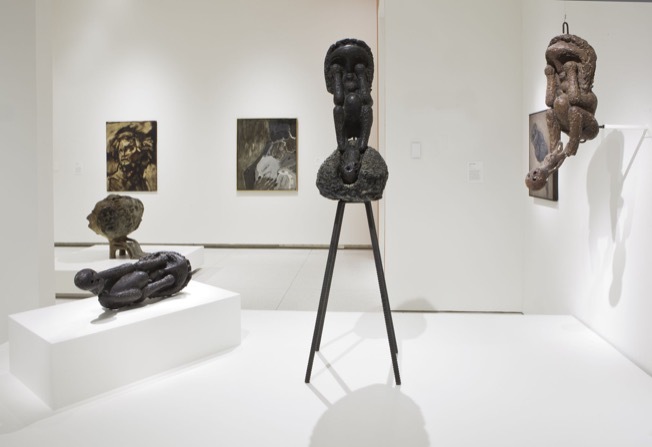 Inspired by Fred Berger’s Untitled (1958) on display in Monster Roster. An original poem by University of Chicago student Rachel Covil, inspired by George Cohen's 1962 work Vestibule (Phenomenology of Mirrors III). The sixteen artists of the Monster Roster. News and notes on our special exhibition, Monster Roster. John Corbett and Jim Dempsey, independent curators and gallery owners; Jessica Moss, Smart Museum Curator of Contemporary Art; and Richard A. Born, Smart Museum Senior Curator. The exhibition and catalogue have been made possible in part by the Estate of Gerald and Eunice Ratner, the Terra Foundation for American Art, the Smart Museum’s Pamela and R. Christopher Hoehn-Saric Exhibition Fund, the Efroymson Family Fund, the National Endowment for the Arts, and Ulrich E. and Harriet H. Meyer. Additional support is provided by the Biff Ruttenberg Foundation and the Karla Scherer Center for the Study of American Culture at the University of Chicago. 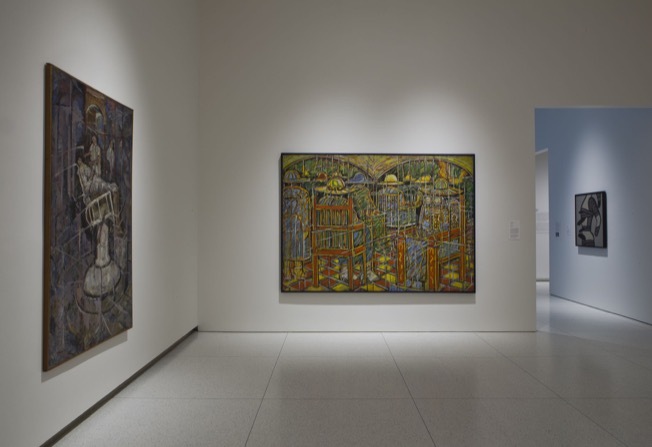 Presented in the Richard and Mary L. Gray Gallery and the Robert and Joan Feitler Gallery.